Philadelphia -- April 28, 2017 -- The Polynesian Cultural Center, in conjunction with the Polynesian Football Hall of Fame, held a Draft Day Luau in Philadelphia on April 28. The event was organized by Coltrin & Associates to kick off the PCC's Million Visitor Initiative, honor the PCC and CEO P. Alfred Grace for their accomplishments in preserving and perpetuating the traditions of Polynesia. 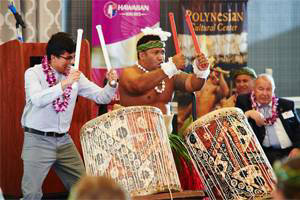 The event also celebrated the Polynesian culture and the enormous impact it has made on the game of football. By all accounts, the event was a huge success. 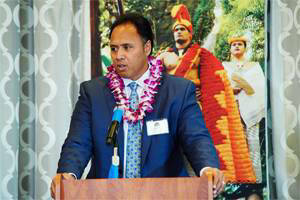 There were featured key note addresses from Vai Sikahema, anchor for NBC 10 News in Philadelphia, 2016 Polynesian Football Hall of Fame Inductee, and first Tongan to play in the NFL, as well as Ken Niumatalolo, Head Football Coach at The US Naval Academy, and inaugural inductee into the Polynesian Football Hall of Fame. The wonderful menu of authentic Polynesian cuisine was prepared by the PCC's own Executive Chef Felix Tai. Authentic family-friendly entertainment was provided by Sione Milford and Creasepaul Tofa, cultural ambassadors who joined us directly from the PCC, and Polynesian dancers from friends of the PCC Lei Pasifika. 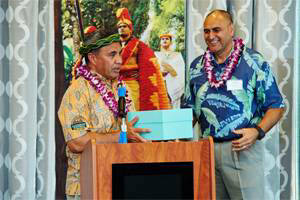 Vai Sikahema makes presentation to P. Alfred Grace, CEO of the Polynesian Cultural Center. Ken Niumatalolo addresses the guests at the Draft Day Luau. 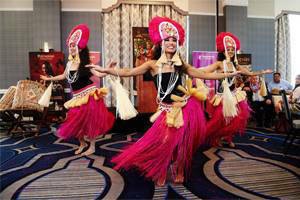 Lovely Polynesian dancers from Lei Pasifiika performed a variety of authentic dances. Cultural Ambassadors from the Polynesian Cultural Center provided guests with entertainment, demonstrations and big laughs. The Draft Day Luau was the culmination of the PCC's east coast media tour which promoted the Polynesian Cultural Center and its mission, and featured its cultural ambassadors, Sione Milford and Creasepaul Tofa, who performed slap dance and fire knife demonstrations. Chef Felix Tai was also on hand to demonstrate authentic Polynesian cuisine recipes.